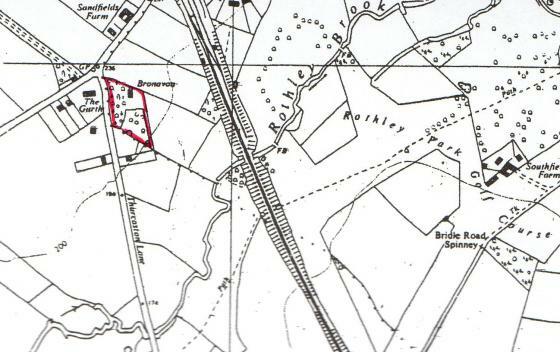 We first came to this site when we were recording the Ancient Ecclesiastical Boundary of Rothley (RAPS) as it runs along three boundaries to this property. Coming along Station Road, Rothley, round the corner of Thurcaston Road and then down the side boundary towards West Brown Hill Field, Site 179 and into the Ancient Demesne Site 198. This property has a lovely garden with two Ancient Trees Oak Tree 227 with a girth of 3.8m and Oak Tree 226 with a girth of 4.9m with this latter tree being on the ancient boundary and on the side of a ditch. We were kindly given permission to enter the property to record the trees and met the gardener. Details of the ancient boundary research are attached. Location: Station Road and Thurcaston Lane. Map Title: Site 114 (Station Road) & Site 178 (Thurcaston Lane). Owners: Access from the verge along a public road. This Stint continues as a mostly Hawthorn hedge planted in an almost double row towards the field gate near to the corner of Thurcaston Lane. In this part there is a little evidence of Hazel and Blackthorn. Just before the gate there is a specimen Oak but it does not qualify as Ancient. After the gate the hedge thickens with undergrowth with the end of the stint on the boundary of the house called "Bronavon". At the start of the Thurcaston Lane the road is well above the base of the hedge as forms the start of a ditch, which continues to the end of this Stint. The next part of this Stint forms the front boundary of "Bronavon" and is a Swithland slate wall fronted by a well-formed ditch. The garden of this house consists of a small woodland, which is shown on the 1842 map of the Parish of Rothley, and their present front boundary shows as the actual parish boundary. In this part of the Stint on the side of the ditch there is an Ash tree, which has been reduced to a stump but with regrowth. This tree would have been recorded as Ancient had it still been standing. 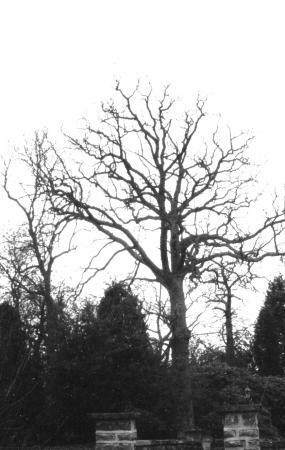 As there is no hedge we do not presently have evidence that one was removed but there does appear to be a line of oaks with an Ancient Oak in Stint 7 which has been recorded as Tree 226, Site 178 in the Natural History Survey. The woodland nearest to the wall is managed and the closest trees are Scots Pine, Oaks and Hazel stands. The Oaks have room to grow and look strong and in good condition. The wall shows an interesting curve, which is also shown on the 1842 map. Owners: Access from the verge along a public road for the first part of the stint but ownership not yet defined for the field. This Stint still follows the wall as described in Stint 6 and takes us to the end of the boundary of "Bronavon" where it changes direction back towards Rothley under the Great Central Railway line. The first part of Stint 7 still has a good ditch in front of the wall but this comes to an abrupt end to later re-emerge before the stint changes direction over the adjoining field. As in Stint 6, the woodland forms the boundary and the trees appear to form a line and are mainly oaks. One Oak is a good size, but not classed as Ancient, but there is a lovely Ancient Oak just on the boundary and has a girth of 4.9 metres. This is detailed as Tree 226 in the Parish Survey. Not far from this Oak there is as Ash stump, which would have been classed as a boundary tree as it is in line with the Oak and the large stump in Stint 6. 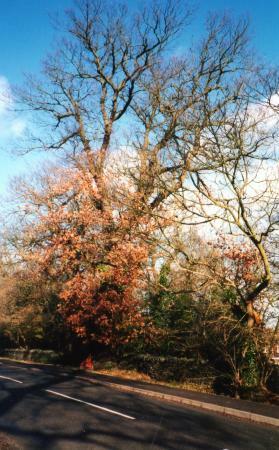 At the end of this property's boundary there is another oak, which is not classed as Ancient and looks as though it has a good number of dead boughs. Again, this part of the stint is the boundary of a small piece of woodland shown on the 1842 map as the Parish Boundary. The woodland is managed and the oaks have room to grow and are in good condition. The Stint now changes direction across the adjoining field so we are back to hedgerow. We now have to trace the owner to obtain permission for access. We made our visit on 21st January and met the gardener in the grounds of the house to check the small piece of woodland for ancient oaks and we did find one that is Tree 227 in the Natural History Survey. Looking at the piece of boundary for the two final lengths 7 C & D it was very interesting to see remnants of the old parkland railings, including a gate, which would have been part of the Temple Estate. We were told that there had been some other pieces of the railings, many of which had been used in the grounds. The land at the side of the house had once been used as a paddock and a row of old apple trees had been individually enclosed by railings perhaps to shield them from damage. The boundary along this part did show evidence of laid hawthorn of some age, hazel that appeared coppiced and holly some as individual trees. It was good to see bluebells emerging along the boundary but too early to look for Dogs Mercury. I must check this out in late March as it is not too far from a Dogs Mercury site and the woodland is shown on old maps. There is also evidence of a ditch on the field side of the boundary but this has broken down with encroaching brambles. The next part of the boundary is very overgrown and we need to find the owner of the field fronting Station Road, as this will give easier access. The first 30 metres of the boundary is the side boundary of Bronavon as in Stint 7. The perimeter link fencing continues to the end of the property boundary with the original boundary inside this. There is a mixture of holly, hawthorn and hazel as before in 7 C & D.
The next 30 metres is very overgrown with brambles so difficult to get close but easier towards the end part. There are Bluebells coming through along this part. There is a good ditch and quite a drop from the garden down to the paddock. It is not a continuous hedge but overgrown hawthorn with Holly and Ash, not ancient. There is an old Elder, rather dead looking, but it has old parkland railings growing through the trunk, totally encased. The next part of the Stint will be recorded by getting access from a field on Station Road for which I have permission from the Tenant Farmer, Mrs Wright. This next part, Stints 8C & D, is a continuous piece of hedge, the first part mainly of Hawthorn that has not been laid and forming a single line along a good ditch. This becomes a double line on either side of the ditch with part looking laid but broken down and sparse in places. At the start of 8C there is a coppiced Oak with five trunks and a smaller one with three. There is Elder in places along this stretch and a few patches of unidentified Willow. There are Bluebells in places. The ditch in one part has been filled by horse manure from the adjoining paddock. The whole of this stint is rather sparse hawthorn but it is interesting to see a good ditch and a double hedge in the latter part. There are no Ancient Trees in this hedgerow but I can see a good one not far away but not part of our Boundary Project.